A creed (also known as a confession, symbol, or statement of faith) is a statement of the shared beliefs of a religious community in the form of a fixed formula summarizing core tenets. Within Anglicanism there are three creeds. 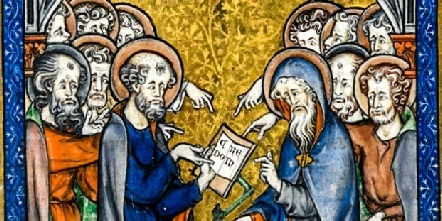 The title Symbolum Apostolicum (Symbol or Creed of the Apostles) appears for the first time in a letter, probably written by Ambrose, from the Council in Milan to Pope Siricius in about AD 390 "Let them give credit to the Creed of the Apostles, which the Roman Church has always kept and preserved undefiled". 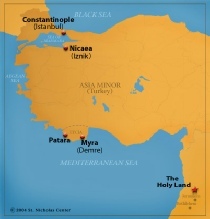 It is called Nicene because it was originally adopted in the city of Nicaea by the First Council of Nicaea in AD 325. 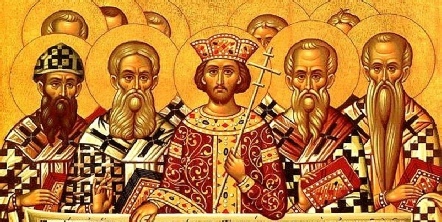 In 381 AD, it was amended at the First Council of Constantinople, and the amended form is referred to as the Nicene or the Niceno-Constantinopolitan Creed. A Latin document composed in the Western Church, the creed was unknown to the Eastern Church until the 12th century. Since the 17th century, scholars have generally agreed that the Athanasian Creed was not written by Athanasius (died 373) but was probably composed in southern France during the 5th century. 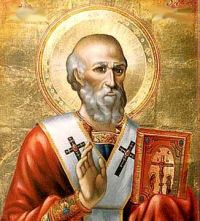 Saint Athanasius of Alexandria or Saint Athanasius the Apostolic, (born c. 293, Alexandria—died May 2, 373, theologian, ecclesiastical statesman, and Egyptian national leader. He was the chief defender of Christian orthodoxy in the 4th-century battle against Arianism, the heresy that the Son of God was a creature of like, but not of the same, substance as God the Father. His important works include The Life of St. Antony, On the Incarnation, and Four Orations Against the Arians.